Catch giant bass and buy new gear in D3's newly announced fishing game. Years ago, my dad would wake up at 5:00AM and take me down the shore to fish, the textbook case of father/son bonding that most kids endure. Reeling in flounder was somewhat enjoyable, but for the most part, sitting in the ocean under the hot sun was boring. Looking back, I'll cherish those moments, but at the time, watching Saturday morning cartoons seemed like a much better deal. Thing is, I've always enjoyed fishing-themed video games, probably because they don't involve motion sickness, engine fumes and worms. There's something fun about kicking back on the couch and reeling in a whopper, especially if said fish is a giant shark or marlin; Sega Marine Fishing is a personal favorite. 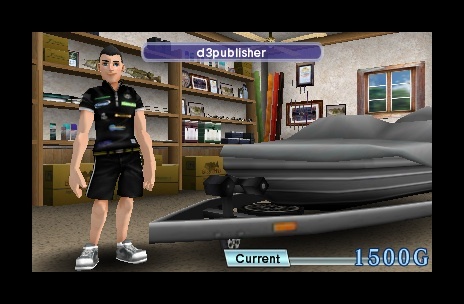 On that note, D3 Publisher and Tamsoft hope to make a dent in the competitive virtual fishing market with Angler's Club: Ultimate Bass Fishing 3D, arriving this summer for the Nintendo 3DS for $39.95. Both companies hope to capture the thrills of tournament fishing while at the same time offering the most authentic experience on a portable system. Angler's Club takes place on the fictional Lake Sunrise, where the goal is to win over 40 different tournaments and become a skilled fisherman in the process. Succeed, and you'll earn cash used to purchase better gear, including reels, rods and over 500 lures. In addition, you'll select one of several different boats and then visit numerous fishing spots. Even better, you can catch bass and other varieties of unannounced fish, which gives the game more variety. On top of that, you can create your fisherman with the editor, and/or use the 3DS camera to put your face into the game. How well this works, of course, remains to be seen. Finally, since this is a 3DS game, expect detailed underwater environments and of course, glasses free 3D effects. 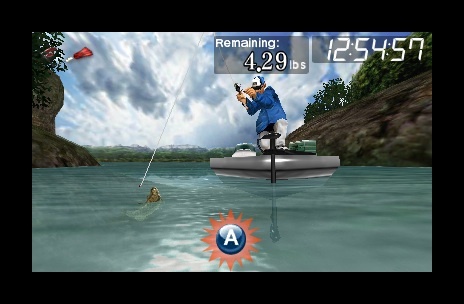 All of this could make Angler's Club: Ultimate Bass Fishing 3D the premier handheld fishing experience. You know, without saltwater hitting you in the face or watching your father gut fish and toss the bloody parts into the water. I love you, dad.